Energy policy and privatisation of state assets are proving contentious among two key sectors behind Jair Bolsonaro's future plan for government. Jair Messias Bolsonaro is one step away from being elected president of Brazil. According to the latest Datafolha poll, he enjoys a voting intention of 59 percent in the lead up to the run-off vote on October 28 against Fernando Haddad. But his probable arrival at the Planalto Palace will not be free of division among those sectors which support him. Among them, there are two groups that no longer hide their differences: the neo-liberal economists commanded by Paulo Guedes, who will be in charge of the Treasury portfolio, and the military, represented by the candidate for vice president, Hamilton Mourao, and General Augusto Heleno. The former are pushing for the deregulation of the economy and the privatisation of state companies, such as Petrobras and Eletrobras, while those in uniform, with a nationalist outlook, have a developmental and statist plan. This rift was exposed this week in an article published by Folha de S. Paulo titled "180-degree turn in energy policy and controversy among the Bolsonaro group". "The economic tensions in the candidate's team can, by the way, become a problem for the future government," José Alvaro Moisés, professor of Political Science at the University of Sao Paulo, told this journalist. Bolsonaro himself last week rejected the total privatisation of Eletrobras and Petrobras, one of the most symbolic proposals of Guedes, in his effort to conquer the centre of the political spectrum and defeat his competitor Haddad. "Nobody wants Petrobras to go wrong, but neither can it benefit from monopolies," he said in an interview with television station TV Band, regarding the company's fuel price policy. Petrobras controls 99 percent of refining in Brazil. Guedes, a liberal economist from the University of Chicago, has proposed the privatisation of all state companies in order to reduce the fiscal deficit and attract foreign investment. "We are clear about where we want to go: decentralisation and reduction of the government's role in the economy, mainly in the energy sector," engineer Luciano de Castro, who along with Guedes advises Bolsonaro, said. According to the São Paulo newspaper, he is one of the technocrats who recommended that a Bolsonaro government "liberalise the economy". The military, meanwhile, is proposing "gradualism" when it comes to implementing reforms and defends an oil policy that defines Petrobras as a strategic asset. Reserve Commander General Oswaldo Ferreira, an Army engineer and one of the coordinators of the Bolsonaro plan for government, was identified by the press as the future Minister of Transport and Infrastructure. He is reported to have affirmed that one of the goals of the Executive would be to resume public works projects "that were stopped" by the Lava Jato corruption scandal. Although he agrees with the concessions programme implemented by President Michel Temer and with the privatisation of oil refining and distribution, Ferreira is more cautious when it comes to the sale of the rest of Petrobras' business units. "Bolsonaro has, during his campaign, embraced the liberal vision of Paulo Guedes in order to win the support of the economic elite. It seems to me that the alliance with Guedes is just an electoral strategy to project his image as a liberal economic candidate. But if we look at Bolsonaro's rhetoric in the last 20 years and how he has voted in Congress, we see that he is an economic nationalist, like other Armed Forces cadres," Oliver Stuenkel, professor of International Relations at the Getulio Vargas Foundation, told this journalist. In the new Congress, there will be 31 lawmakers and four senators who either military men or police officers. In 2014, that number was as low as 18. 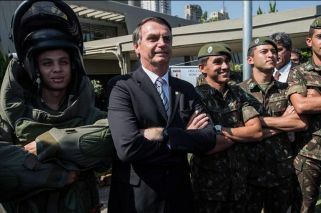 If Bolsonaro, a former military man arrives at the Planalto Palace, he is expected to appoint a general as vice president and other comrades in arms to influential ministries. Brazil's military believes it has another opportunity to work towards the "economic miracle" of the 1970s, when the dictatorship promoted a developmental economic policy. But first they must win the elections and, then, negotiate with Guedes and the CEOs who accompany him. Among the most controversial of Jair Bolsonaro's proposals is to legalise the bearing of weapons. The far-right candidate plans to reform the current Disarmament Statute, which establishes restrictions on the sale and possession of weapons, in favour of a liberal policy on the commercialisation of these weapons, Brazil's CBN radio has reported. Bolsonaro has made the right to bear arms one of the key policies of his campaign. He even greets his followers with his fingers pointed in a way so as to imitate the shape of a pistol. He has also defended the police's right to use force and is pushing for a policy in which any police officer who kills a suspect in the act of service cannot be prosecuted. Days ago he visited a police station in Rio de Janeiro, the BOPE, whose brutality was reflected in the film Tropa de Elite. There, he assured its officers that if he wins the elections, "in January you'll have one of your own in Brasilia".